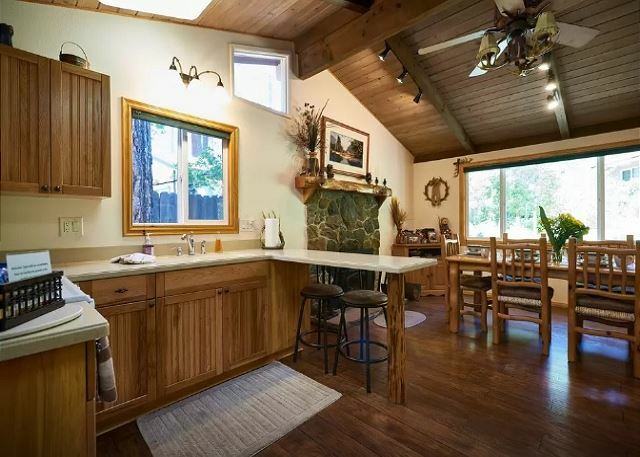 Filled with undeniable amenities and incredible features, this cabin is sure to become an Idyllwild favorite and home away from home in no time. 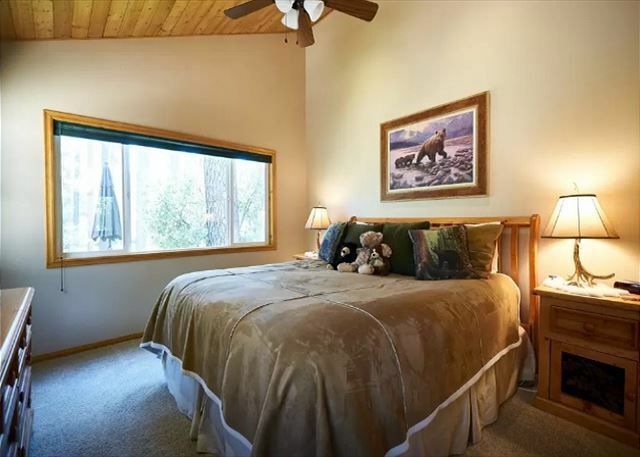 Resting and relaxation are sure to come easy with the soothing breezes and sounds of nature. 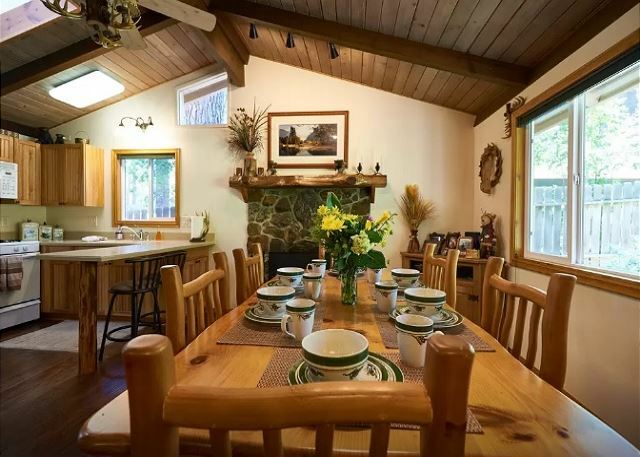 This 4 bedroom, 2 bath cabin is totally comfortable with the best of modern conveniences and yet the cozy feeling of a cabin in the woods. You can explore Idyllwild with its mom and pop shops or take a hike in Idyllwild County Park without getting in your car. 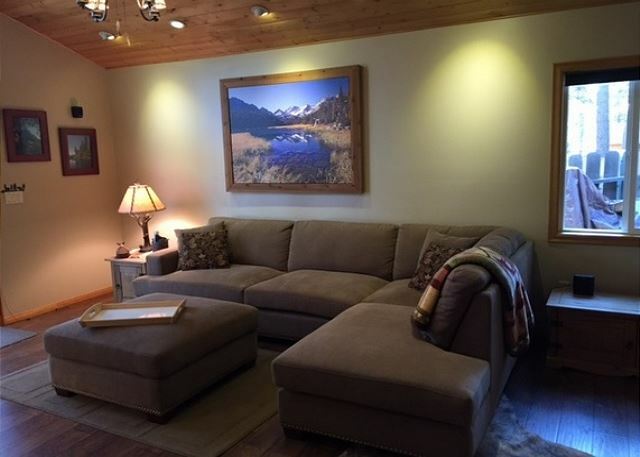 The spacious living room has 50 inch flat screen TV with surround sound and is a great place to rest and relax. 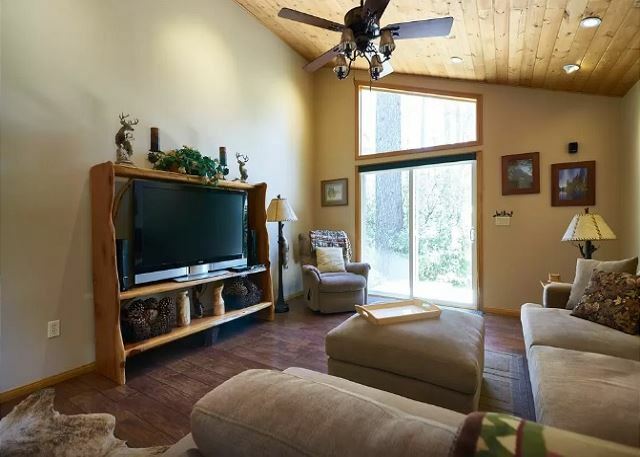 The living room looks out to the large deck and is perfect for entertaining family & friends, or sit back and enjoy the beautiful sounds of nature all around. Weekend rate Friday/Saturday is $325.00 p/night. Weekday rate Sunday thru Thursday is $295.00 p/night. 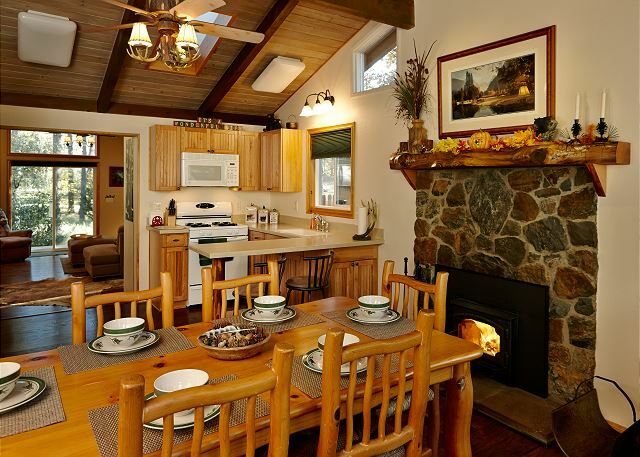 Winter Holiday rate $450.00 p/night (Thanksgiving, Christmas and for New Year's, with a 4 night minimum). 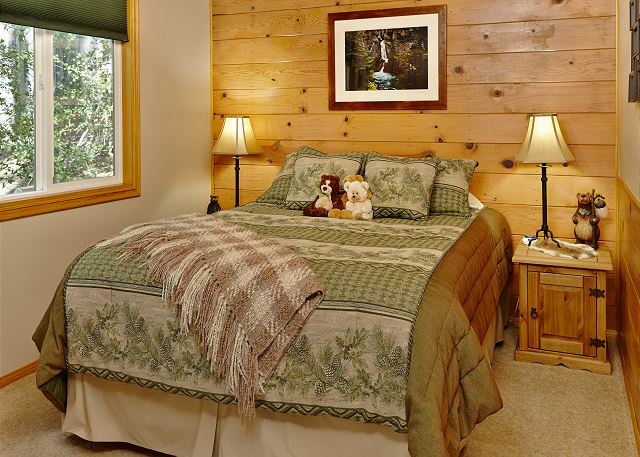 Holiday rate $375.00 p/night, a 3 day minimum may be required. Call us for our weekly/monthly specials. Linen/Prep fee $95.00. The home was perfect and better than described. Very clean and all bedding and linens were fresh and high quality. I loved the decor and fireplace. Check in and out was easy with New Spirit Homes and I appreciated that we had emergency contact information should an emergency arise. Thankfully, we did not need to call but knowing someone from New Spirit was available put my family at ease. Location is convenient, close to restaurants. Spacious place for a group of eight. 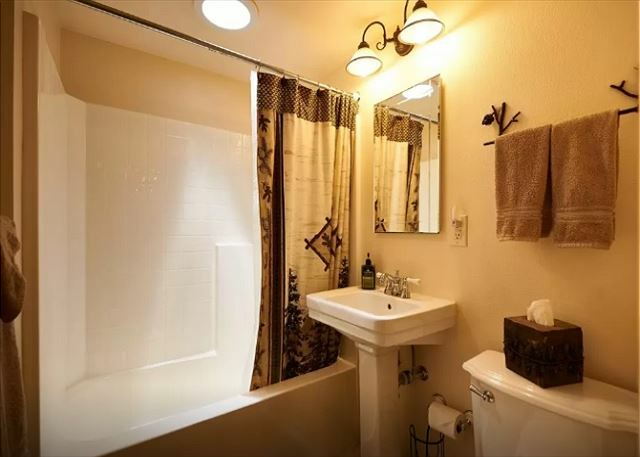 The inside has just been remodeled, it's very clean and the condition is great. Unfortunately we can only stay for 1 night, would love to stay here again in the future. This is our third time staying in this cabin. Very comfortable for our family of 7. Totally stocked with everything one would need. Wonderful yard for the kids to play in or adults to relax in. Looking forward to our next trip. Home away from home. Spacious house and VERY clean. Great backyard as well...lots of open space. Very cute house already decorated with Christmas cheer. We had a great weekend with another family in Idyllwild. The house had everything we needed to make a nice home cooked dinner and breakfast. Kids had a blast feeding and watching the blue jays. Thank you! This home is beautiful. 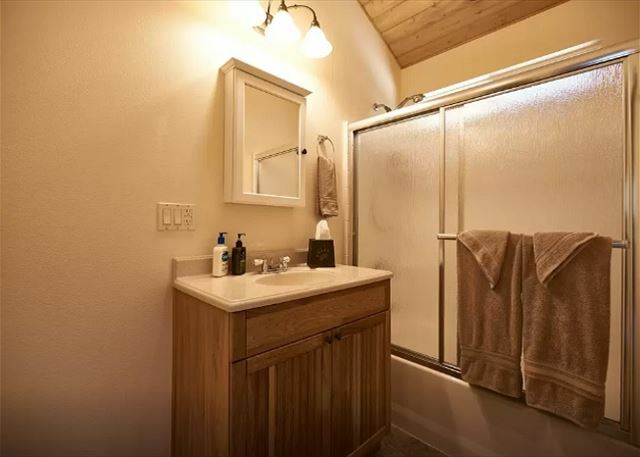 The photos do not even capture all the beauty of this home. You really feel like home there. It was cozy. Everything kitchen, bathrooms and bedrooms were beautifuly cleaned and nicely decorated. Everythng in the home is conviently located and just about everythng you'd need is available. The staff was a pleasure, very polite and beyond helpful with arriving. Only complaint is... not being able to stay longer cause we arrived late so was too dark to really see what the area had to offer till morning. Morning was peaceful and relaxing with the blue jays, but had to get back, so didn't get to enjoy it for to long. And didn't have time to spend in town. So looking forward to going back, but with more time to enjoy everything. Great place to stay. A great rental experience! New Spirit was easy to work with and quickly helped us rent this cozy and comfortable rental. We had 2 families with young kids go away for the weekend. 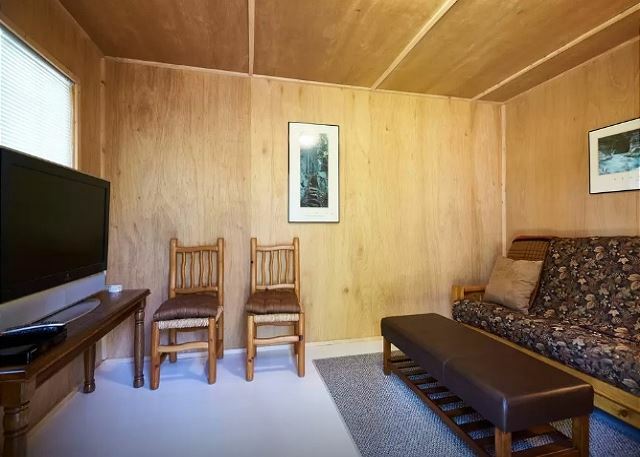 Location was within walking distance to town. Cabin came fully stocked. You literally have to just come with food and clothes. Everything else is provided. The home is lovely!!!! Highly recommend. The weekend getaway was to allow our nephew his first snow experience. 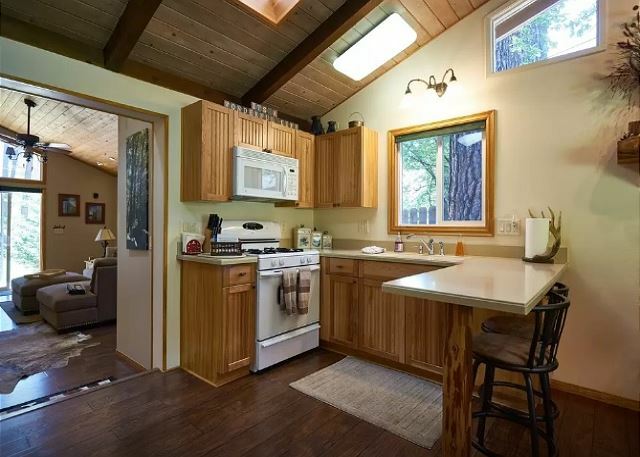 The cabin was clean and inviting. My family and I enjoyed our stay at the cabin and would like to go back again. It was a wonder experience. The cabin was very clean and comfortable. It had all the basics that we needed and more. I really enjoyed the heated bedding, particularly since it snowed and it was nice to be warm and comfortable. My only feedback is that it was a lot of work to keep my small 14 month old baby safe. There is a large step down from the kitchen area to the living room, which made it uncomfortable and unsafe to let her walk around. Also, there were lots of things to grab, pull and breakables in close reach. Having said that, I had to pickup and put some of the decorations away from my baby and be by her side the make sure that she didn't fall while going up or down that step. Other than the place not being kid friendly, the entire experience was amazing and we had a great time. I would most certainly come back to this cabin. We loved the decor, cleaned, the distance from the main shopping and eating areas and all the attention to detail in the house. 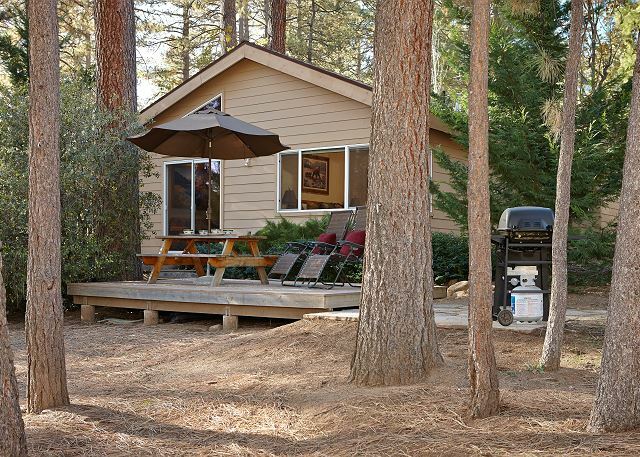 We stay in Idyllwild cabins many times through out the year. 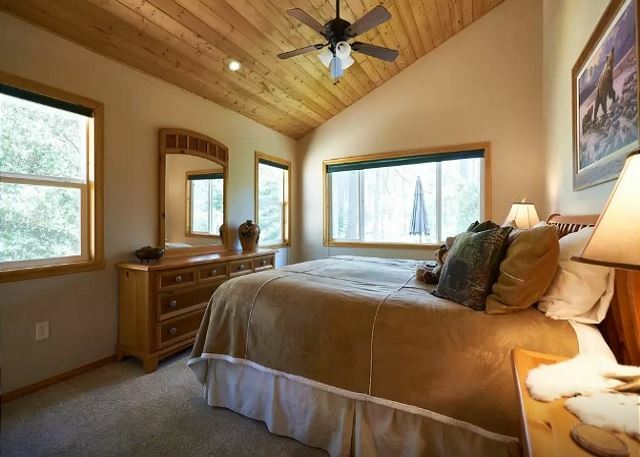 In The Pines is a great property. Very clean, Very spacious. 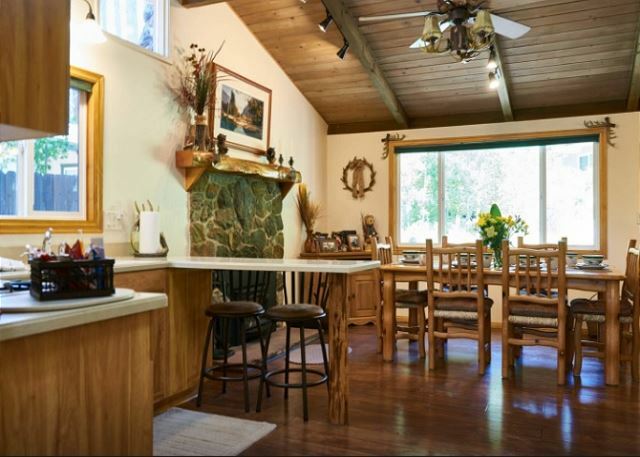 Perfect location for walks through Idyllwild County Park. 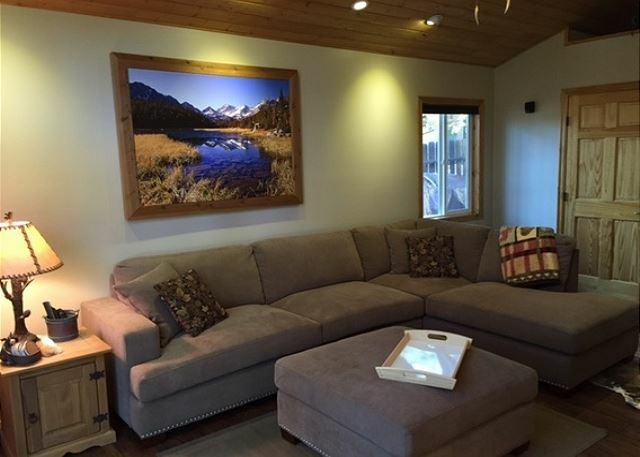 This property even provides guests with the Adventure Pass & Local Park Pass which pretty much covers access to all the places you want to see while up here. Our family of 5 had a great time. Serenity Now! My family and I loved this rental. 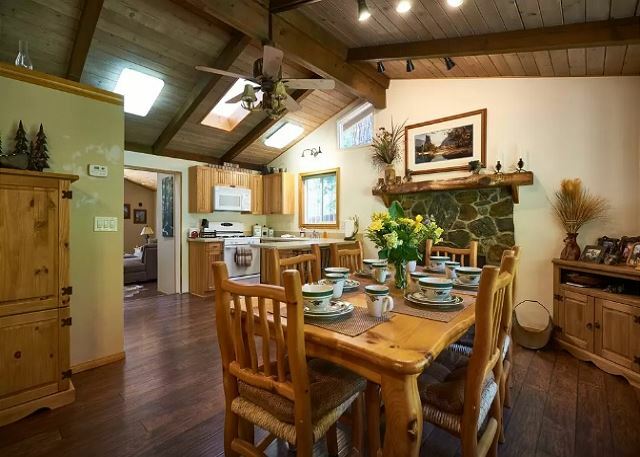 I have visited Idyllwild many times before, but it was a first for my in-laws and other friends. The property was very clean, everything was neatly organized, and very useful instructions were provided for us on the location of everything we needed. The backyard is a wonderful area to hangout with kids and family. We will definitely return in the very near future. Really great house for a weekend away. Monica and the team at New Spirit were incredibly easy to work with, fielding many questions as we tried to find "just the right property" for our group, which included 3 kids. Great backyard for kids to play and watch the wildlife and great location to walk to town and some local hikes. The owners provide an adventure pass and local pass to be able to access the great outdoors, which was greatly appreciated. We took a quick drive to pretty Lake Fulmor and a great hike up the Perimeter Trail to the Nature Center (that hike is a little steep for the little ones, but our 7 year old loved it!) The house was very well stocked for a vacation home and we were able to make all our meals at the house with minimal fuss.